"You call that a refrigerator? There's nothing in there to eat." The sports genre is perhaps the strangest franchise in which to spawn sequels. While several trilogies house a collection of above average films (Star Wars, Indiana Jones) there has yet to be a sports film franchise that seems to be able to keep it going for the duration. The Major League and Mighty Ducks films came out of the gate with enormous success, only to see their sequels go from bad to, at times, downright awful. So where does The Bad News Bears trilogy ranks in all of this? Well if I were to use a sports metaphor I would say this: Imagine a pitcher who does terrifically well for three innings (The Bad News Bears), falters a bit in the middle innings (The Bad News Bears in Breaking Training) and ultimately loses everything that worked early on and blows the game (The Bad News Bears Go To Japan).As the title suggests, the third installment finds the team on their way to Japan after the events that transpired in The Bad News Bears in Breaking Training. At first the team is not allowed to play in Japan, due to the fact that the infinitely better Japanese team has battered each American representative. After making a plea on national television, the team catches the eye of Marvin Lazar (Curtis), a con man who offers to broadcast the game in the States, in hopes of making a large amount of money as the Bears get demolished by the Japanese team. While in Japan, the kids fall into several fish-out-of-water antics while Lazar tries to close the deal with a sponsor. Eventually, everything comes together in the end and... well you can guess what happens. The main problem with TBNBGTJ is that we have seen this all before. Is there any doubt how the game will turn out after we have seen it played the same way in the previous two films? Screenwriter Bill Lancaster (who also wrote the first film) certainly offers numerous chances for the story to be winning and enjoyable but, instead, it becomes tired and overlong. When the big game does finally occur, there is no sense of excitement or suspense, just a countdown to the point when the Bears turn things around and pull out the victory. Another problem is that we are treated to scenes of Lazar trying to finagle a deal and Kelly (Haley) falling in love with a Japanese geisha-in-training, and this essentially makes up the bulk of the scenes set in Japan. The film would have worked better if it focused on the other kids and their adventures, rather than the antics of these two uninteresting characters and subplots. The cast is a collection of new kids, as well as a few that have returned from The Bad News Bears in Breaking Training. Curtis, who gets the lions-share of screen time, seems to be uninterested; his scenes lack any sort of emotion or excitement. The actors portraying the members of the team are each fine in their roles, while Haley does his best when he romances his would-be girlfriend. Image Transfer Review: Presented in a 1.85: anamorphic transfer, the film does, at times, show its age; for a film that is now 24 years old, it could look a lot worse. From the start, sharpness and detail are done nicely, with a few scenes appearing a bit soft, but for the most part the transfer does have a nice film-like look. The image is littered with edge enhancement, with slight print flaws and grain evident as well. Audio Transfer Review: The Bad News Bears Go To Japan is presented with its original mono soundtrack intact and as one might expect, it is uneventful. Dialogue is difficult to hear at times and sounds flat throughout. Extras Review: Film-themed static menu pages and twelve chapter stops make up the extra features on this disc. 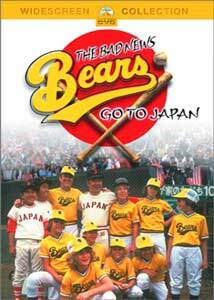 As sequels go this one is pretty bad, so it is safe to say that unless you are looking to complete the trilogy, one would do well staying away from The Bad News Bears Go To Japan.